Our Kindergarten program offers distinct advantages to children and parents. Our program allows teachers the freedom to spend more time with your child, address their individual needs and teach beyond the basics. Lightbridge Academy understands your concerns about making sure your child is ready for first grade. The nurturing care your child receives, coupled with our strong academic program, provides a winning combination for Kindergartners. When graduation time arrives, you will agree that your child has a considerable advantage being a Lightbridge Academy graduate! Our teachers follow a detailed curriculum that exceeds state educational requirements. Our program stresses comprehension as Kindergartners advance from words to reading and from counting to addition. However, academics is not our only focus, we reinforce important life skills such as communication, respect, honesty and sharing with others. "Rather than just giving my child the answers to memorize, he is learning to solve problems. The STEM activities in this Kindergarten have helped him advance in so many different areas." Anything is possible in Kindergarten! Children begin to read independently, express themselves through writing, and expand on math basics to gain a deeper understanding of numbers, measurement, and patterns and abstract math concepts. Teachers know how to stimulate young minds through our STEM (Science, Technology, Engineering and Math) concepts and hands-on activities throughout the day. The Kindergarten classrooms are also equipped with state of the art technology. Interactive white boards and iPad tech tables to foster active participation and create an engaging, multimedia learning experience for children. 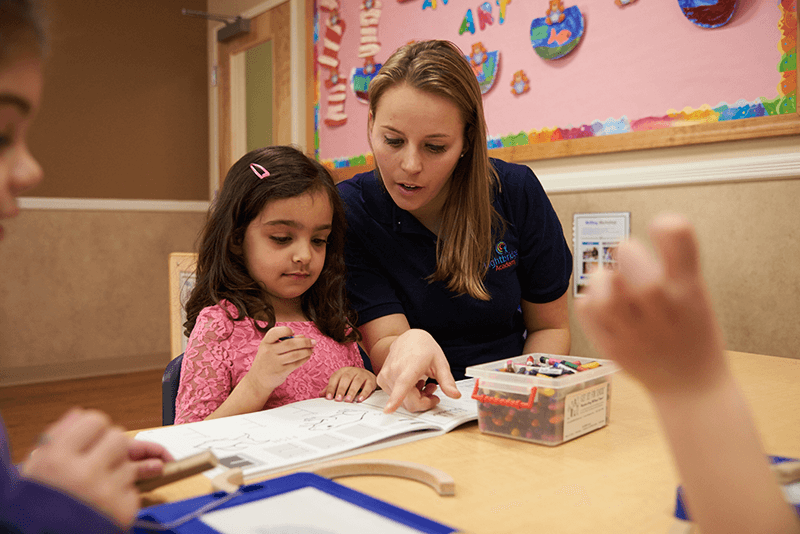 Lightbridge Academy brings together the fundamentals of education into theme-based lessons with a hands-on, multi-sensory approach that impacts the whole child. Through child-led exploration and intentional teaching, teachers embrace every moment as another opportunity to learn, meeting all developmental areas, unlocking every child's potential to prepare them for elementary school and beyond. Creative Arts & Music: Children learn to express themselves and explore the cultures around them through creative arts and music. Art media advances to clay, watercolors, sculpture, and texture. Music appreciation reveals a wide range of music from a variety of cultures, styles and time periods. Music theory is explored through beat and patterns in rhythm and changes in melody. Physical & Well Being: Health and nutrition become part of daily routines learning more about human growth and parts of their bodies, muscles, vitamins and importance of exercise. Structured games, team work and cooperation become outside fun time! Language & Literacy: This time is critical for language, literacy and a love of reading. Reading comprehension is deepened by retelling stories in detail, exploring sentence structure and introducing new styles of literature. The nationally recognized Handwriting Without Tears® is used to develop writing skills starting with drawing, then journaling and eventually writing stories. Mathematics & Science: STEM learning integrates and intentionally creates opportunities to combine math and science concepts in engaging activities. Measuring, comparing, estimating, along with compiling data and forming conclusions advance children's math and science skills. Social & Emotional: Children build confidence and self-esteem while also learning about their role as a citizen and developing empathy through philanthropic activity and volunteerism. Children study cultures and history from around the world. Parent eCommunication App - Do we go overboard keeping you connected? Of course we do. You will receive reminders, notifications of your child's achievements, photos, video, meal schedule and more in your daily report.